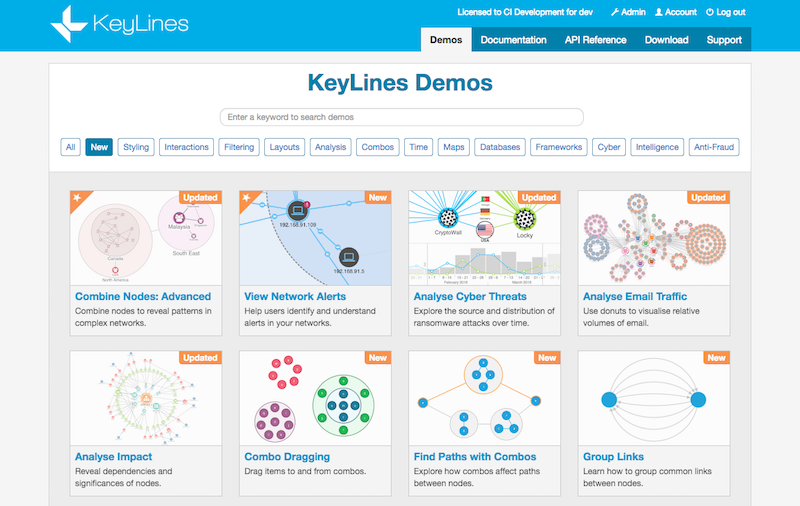 Over the last 7 years, hundreds of developers have used KeyLines to build visualization web applications for Neo4j. As a result, we’ve honed our integration code, documentation and support to make the process as simple as possible. Another popular option – which we’ll cover in this post – is to use one of our demos to kick-start the process. With this approach, we’ll use KeyLines’ Cypher integration and a one-to-one mapping between Neo4j and the chart, so switching the schema and producing your own visualization is fast and simple. Let’s get started. Graphics rendering is powered by HTML5 Canvas or WebGL – KeyLines will switch between the two depending on the browser – so it performs well even with larger graphs. Also, everything stays inside your corporate firewall so data security shouldn’t be an issue. Once you’re in the KeyLines SDK, take a few minutes to look around the site and review the documentation. The ‘Basics’ section of the Documentation tab is the best place to start. There’s a few different demos designed for Neo4j integration, but ‘Integrate with Neo4j’ is the most straightforward. 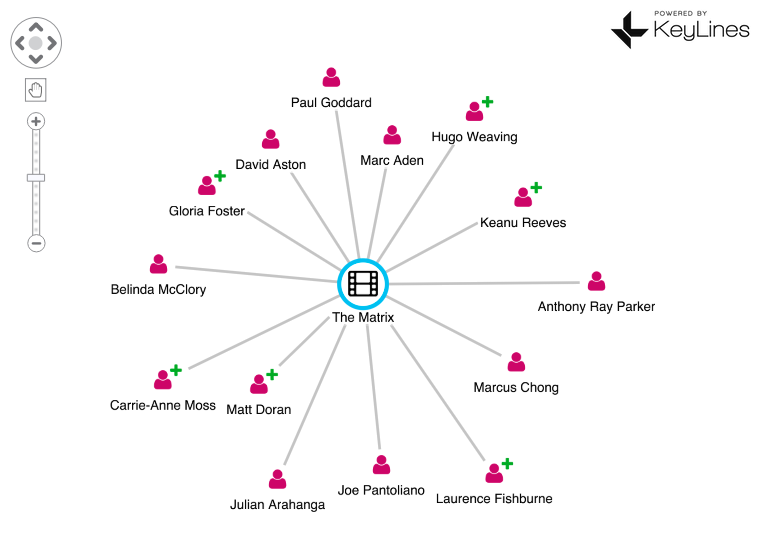 It uses Cypher queries and KeyLines’ incremental layout to explore a Neo4j dataset of movies and actors (appropriately starting from The Matrix). To the right of the demo KeyLines chart we’ve included an information box, containing the Cypher queries being raised, and some UI to run layouts from the KeyLines API. From the demo page, click ‘Download’. assets contains images for different components of the KeyLines chart, like the navigation controls and the chart watermark. css (as you’d expect) contains the different CSS files for the rest of your webpage. You can use ours, or write your own. images contains the image files for nodes, glyphs, etc. neo4j-db.js is the database driver, including Cypher integration and JSON parsing code. 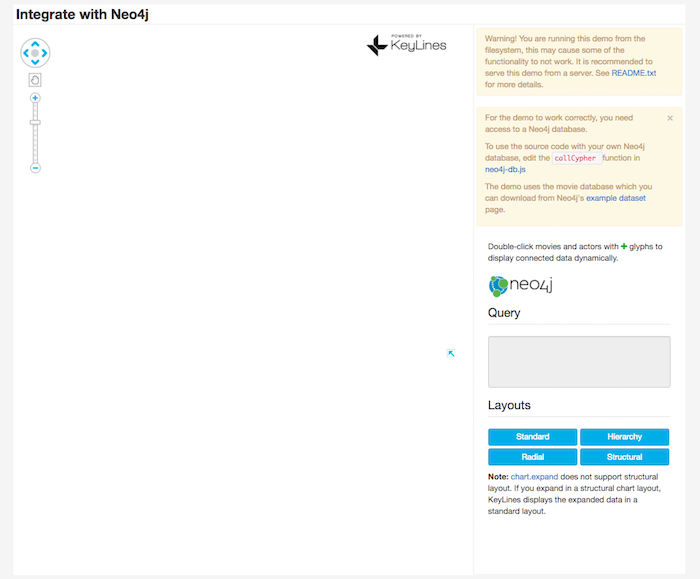 neo4j.js adds KeyLines functionality, as well as tying some of that functionality to general UI (e.g. run a layout when the user clicks on this button). At this point, the demo is running from our local filesystem. The chart is blank because we haven’t connected it to our database yet. Obviously, this approach is only recommended during KeyLines prototyping. When you deploy your app in production, you’ll run Neo4j on a secure web server and only expose certain endpoints to KeyLines. 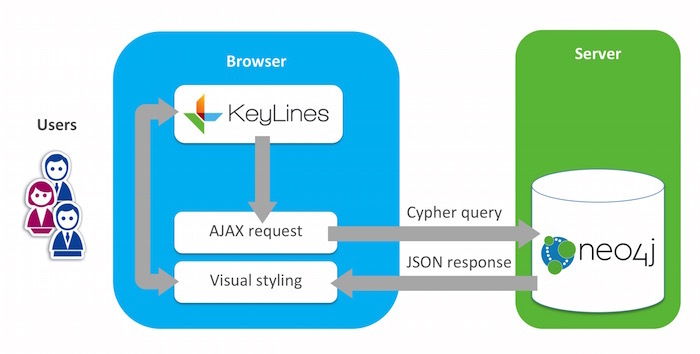 Process the Bolt response into KeyLines JSON – in a single loop you can: a) convert the node IDs, b) do the same for link/edge start and endpoints, c) convert other numeric properties. More detailed instructions can be found in this blog post. Next you need to map your Neo4j data to the KeyLines schema, and choose the visual model you want to use. This stage can be as simple or as complex as you like, but our demo uses one-to-one mapping between the chart and database, and follows a typical user workflow (expand and explore). For most developers, a few simple ‘find and replace’ commands should do the trick. E.g. open neo4j-db.js, find ‘e: item.d.type === ‘movie’ ? 1.7 : 2.5’, which enlarges movie nodes in our demo, and replace movie with whichever node type from your schema you want represented as a larger size. You’ll also need to adjust the Cypher queries in-line with your own schema. That’s in the queryTemplates object in neo4j-db.js. 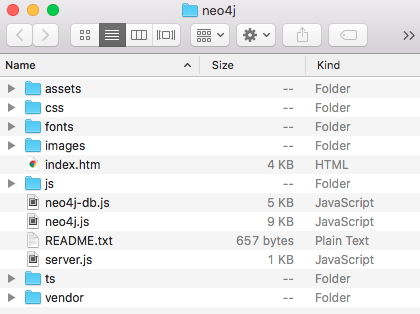 Finally, you can also change node and link styles at this stage, for example by finding the ‘dbDemoTheme’ object in neo4j.js and changing the font icons by editing the ‘fi’ property. The final step is to start your database and load KeyLines. If you’re using Node, that’s a simple `npm install` followed by `npm start` in the root folder. By now, you’ll have a simple demo, running from your database with your own visual styling. It’s a great starting point for you to visually explore and understand your Neo4j data. This tutorial is just the starting point. KeyLines and Neo4j are a powerful combination, and make it easy for you to build custom, flexible and high-performance graph exploration tools. Start a trial over here, or contact us for more information.